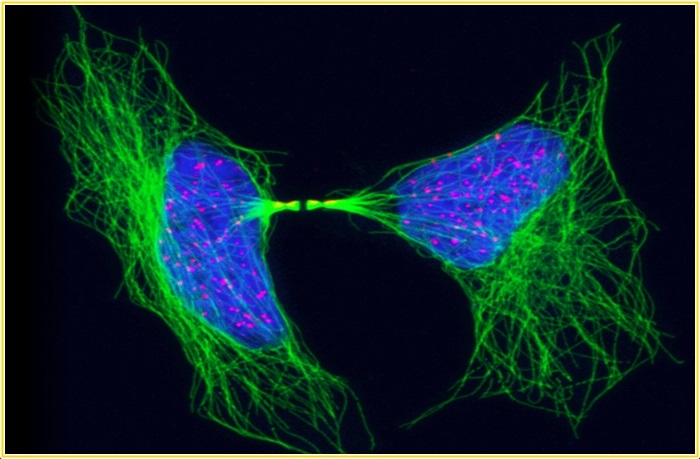 Imaging and microscopy tools have greatly facilitated research towards the understanding of human health and disease. Starting from the first microscopes, the tremendous advancement in imaging technologies has led to scientists being able to observe biological structures and processes in unprecedented detail. Knowledge gained from the application of these instruments and methodologies has illuminated unknown facets of the functioning of biological systems in the continuous quest for scientific discovery. Modern imaging systems also represent a true multi-disciplinary effort in discovery and innovation, with physicists, engineers, chemists, biologists and clinicians combining efforts to address pressing problems in biomedicine. 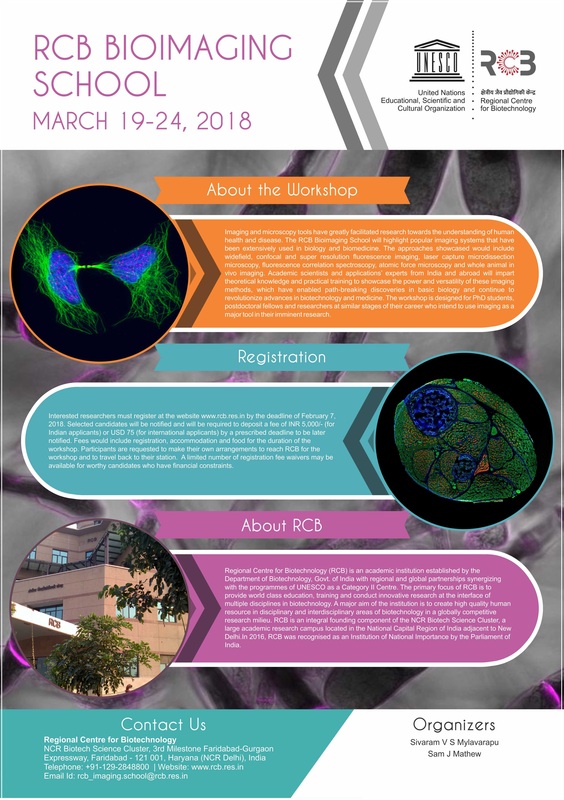 The RCB Bioimaging School will highlight popular imaging systems that have been extensively used in biology and biomedicine. The approaches showcased would include widefield, confocal and super resolution fluorescence imaging, laser capture microdissection microscopy, fluorescence correlation spectroscopy, atomic force microscopy and whole animal in vivo imaging. Academic scientists and applications’ experts from India and abroad will impart theoretical knowledge and practical training to showcase the power and versatility of these imaging methods, which have enabled path-breaking discoveries in basic biology and continue to revolutionize advances in biotechnology and medicine. The workshop is designed for PhD students, postdoctoral fellows and researchers at similar stages of their career who intend to use imaging as a major tool in their imminent research. Interested researchers must register for participation by the deadline of February 11, 2018. Selected candidates will be notified and will be required to deposit a fee of INR 5,000/- (for Indian applicants) or USD 75 (for international applicants) by a prescribed deadline to be later notified. Fees would include registration, accommodation and food for the duration of the workshop. Participants are requested to make their own arrangements to reach RCB for the workshop and to travel back to their station. A limited number of registration fee waivers may be available for otherwise worthy candidates who have financial constraints. Requests for registration fee waivers must be accompanied by strong justifications supported by an email from the PI (to the workshop email id) and would be adjudged on the merit of the case. Regional Centre for Biotechnology (RCB) is an academic institution established by the Department of Biotechnology, Govt. of India with regional and global partnerships synergizing with the programmes of UNESCO as a Category II Centre. The primary focus of RCB is to provide world class education, training and conduct innovative research at the interface of multiple disciplines in biotechnology. A major aim of the institution is to create high quality human resource in disciplinary and interdisciplinary areas of biotechnology in a globally competitive research milieu. 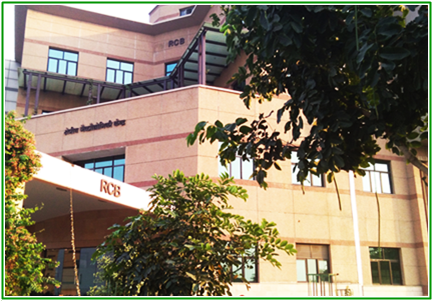 RCB is an integral founding component of the NCR Biotech Science Cluster, a large academic research campus located in the National Capital Region of India adjacent to New Delhi.In 2016, RCB was recognised as an Institution of National Importance by the Parliament of India. The Department of Biotechnology (DBT), through the Regional Centre for Biotechnology (RCB) and the National Institute of Advanced Industrial Science & Technology (AIST), through its Biomedical Research Institute (BRI), Japan had entered into a partnership for capacity building initiatives in bio-imaging and biotechnology in the year 2014. This initiative facilitates enhancement of career opportunities for scientists and researchers working in biomedical, clinical, and other related areas of biotechnology and complements the existing bilateral research cooperation between the Govt. of India and the Govt. of Japan. A DBT-AIST joint lab (DAILAB) for advanced research training in bio-imaging has been established at RCB. The DAILAB will facilitate joint research collaborations engaging Indian and Japanese scientists and support selected Indian researchers for training in specialized areas of bio-imaging and biotechnology, both in Japan and in India. The new collaboration provides an opportunity for both the institutions in capacity building, training and research collaborations and will benefit young scientists not only in India and Japan but also from the UNESCO member countries in the Asia-Pacific and SAARC regions. Indeed, through the current initiatives, RCB, an institution engaged in broad-based multidisciplinary training, education and research is poised for broadening its horizons and will facilitate bridging science and knowledge dissemination for the betterment of mankind. © 2010-2018 RCB Imaging School Courses Application. All rights reserved.